In the heart of Gothenburg City you have the Elite Plaza Hotel Gothenburg. Staying at the Elite Plaza Hotel is truly an experience in it’s own. The Elite Plaza Hotel Gothenburg opened it doors to guest from all over the world in 2000. Already in the entrance will the guest be welcomed by the fantastic interior with paintings in the ceiling and floor from 1889. Book YOUR Room at Elite Plaza Hotel Here! In the hotel you also have the Swea Hof restaurant which is one of Gothenburg’s top gourmet restaurants. You can read our review of the Swea Hof restaurant here: Swea Hof. Here you can enjoy great Swedish gourmet food for lunch or dinner. Together the Elite Plaza Hotel Gothenburg and the Swea Hof restaurant arranges wine, champagne, whiskey and chocolate tastings on a regular basis. You can also book your own tasting which could be a great compliment to the end of a long conference. The Elite Plaza Hotel Gothenburg has several different size conference rooms for you to use. All conference rooms are equipped with the latest technology and the largest conference room can accommodate up to 50 people. The standard rooms at the Elite Plaza Hotel Gothenburg are between 15 – 18 square meters in size. In the standard room you have a single bed, mini-bar, cable-tv, wireless and wired internet access. Picture of the Elite Plaza Hotel Gothenburg standard room. In the Elite Plaza Gothenburg Superior room you will either find a kingsize bed or two single beds. In the room there will also be a robes plus the usual minibar, cable-tv, hairdryer and both wired and wireless internet access. The superior rooms offers the same interior as the standard rooms but the rooms themselves are a bit bigger. The Elite Plaza Gothenburg superior rooms are between 18 – 25 square meters. Picture of the Kingsize bed that you will find the superior room of the Elite Plaza Hotel Gothenburg. There are two different types of Deluxe rooms at the Elite Plaza Hotel Gothenburg for you to choose between. The one Deluxe room offers a traditional interior and the other Deluxe room offers a very modern and stylish interior design. On top of the usual hotel room amenities you will find a well equipped bathroom with both toothbrushes and a shaving kit. When staying in a Deluxe room you will be able to take advantage of the Elite Plaza Hotel Gothenburgs tuck in service which basically is someone from the hotel coming up to your room closing the curtains, removing the bedspread, putting a chocolate on your pillow and leaving your requested beverage on the bedside table. The Deluxe rooms at the Elite Plaza Hotel Gothenburg are between 30 – 35 square meters. 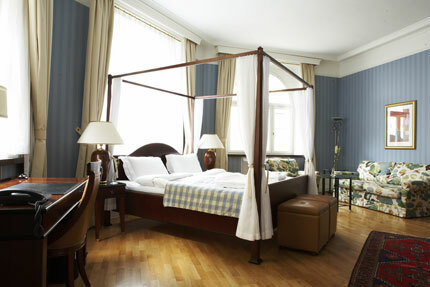 The Deluxe room at the Elite Plaza Hotel Gothenburg featuring the traditional interior. The Deluxe room at the Elite Plaza Hotel Gothenburg featuring the modern and stylish interior. The junior suites at the Elite Plaza Hotel Gothenburg are approximatley 42 sqm in size. The junior suites including it’s bathrooms are well equipped. One thing you don’t have in the previous hotel rooms are a stero system. Upon arrival you will always find a complimentary bottle of wine together with fresh fruit. Like with the deluxe rooms the Elite Plaza Hotel Gothenburg also offer guests staying in the junior suites the tuck in service. Picture of one of the Junior suites at the Elite Plaza Hotel Gothenburg. There are three suites at the Elite Plaza Hotel Gothenburg. The suites are between 80 – 200 sqm in size and they are called The Svea Suite, The Maharajah Suite and The 506 Suite. The Svea suite is the biggest of the three suites and it has three big bedrooms, living room and all rooms have a old classic Swedish interior. The two other suites are 80 sqm each and both offers a great view over Gothenburg city. The 506 suite has a modern interior and the Maharajah suite has an old classic interior with ceiling paintings by the artists Jonhondel & Richter. The ceiling has been classed as a cultural heritage. Like with the Deluxe and Junior suites you will also be able to take advantage of the tuck in service when staying in one of the three suites. Picture of the Elite Plaza Hotel Gothenburg’s 506 suite’s bedroom. The living room in the 506 suite at the Elite Plaza Hotel Gothenburg. Remember to read our review about the Swea hof restaurant which is the gourmet restaurant located within the Elite Plaza Hotel Gothenburg.